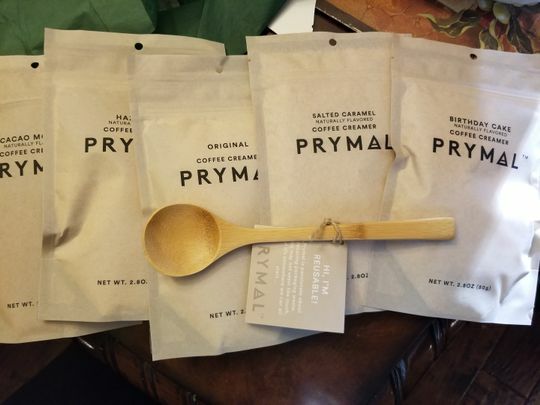 We’re passionate about reducing the waste we create, so we’ve traded those little plastic scoopers that we collect and throw away for a beautiful wood measuring spoon. 2 heaped scoops is the perfect single serving amount of creamer :) We hope you love using this beautiful coffee accessory everyday as much as we do! Debi T. Reviewed by Debi T.
I have tried just about everyone one of these Creamers and I have not had one that I would rate below a 5 star. And these spoons... absolutely adorable!! Melinda C. Reviewed by Melinda C.
Sonya L. Reviewed by Sonya L.
I ordered two and received one with my sample pack. I now have three favorite spoons. They are perfect for my creamer, but I seriously love them for everything. Smooth and beautiful! Dawnielle M. Reviewed by Dawnielle M.
Picture doesn’t do them justice! I ordered three and may order more...just sayin’. Good price. Perfect creamer scoop. Adds a touch of rustic country to my kitchen. Love! Thanks again Prymal! Lori P. Reviewed by Lori P.
Love this spoon! I do own one but am getting another one, they look cute by my coffee maker! No need to find my measuring spoons.